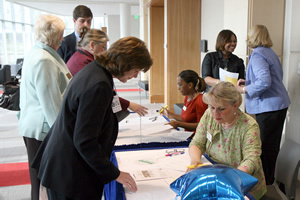 The Conference Center staff works with the group's authorized representative to schedule appropriate rooms, equipment and related services to meet the needs of the customer. The Center reserves the right to reassign reserved space to comparable space in order to meet business or daily operational requirements. Easels can be provided for any posters / signs to be displayed during a meeting. No signs or posters may be pinned or taped to the doors or walls. The placement of organizational banners must be arranged in advance. Tacks, nails or screws cannot be used for any purpose in the center. Directional signs are permitted with prior approval by center staff. The Conference Center staff can assist with arranging for purchase of freshly cut flowers, centerpieces, etc. No decorations may be hung from the ceiling or placed on walls. All candles must be globed. The use of glitter and confetti is prohibited. All food and beverage services must be managed and provided by the conference center's caterer, Flavours by Sodexo Catering Services. Catering guarantees are due no later than noon, three days prior to the event. The group will be billed for the guarantee or for the actual number served, whichever is greater. All shipments must be approved in advance. A labor charge may be assessed for unloading items to storage areas. No shipments will be accepted earlier than 48 hours prior to an event and must be picked up within 48 hours after the event unless prior arrangements are made.